Camden's Campbell Soup Co. has always been known for its soup and probably always will be, but when it completes the sale of Campbell Fresh and Campbell International almost half its sales will come from snacks. Campbell Soup Co. surged more than 10 percent Wednesday as the Camden company’s quarterly results topped Wall Street expectations, and new chief executive Mark A. Clouse provided an initial public appraisal of the 150-year-old firm that last year was under attack by an activist investor after a botched attempt to move into fresher foods. “I certainly don’t want to portray this as simple or an overnight fix,” Clouse told analysts on a conference call. He said he was confident that Campbell has great brands that can be managed with discipline on the cost side and the “high-powered" management team needed to get Campbell on a growth track. The company’s brands include V8, Prego, Pepperidge Farm, as well as Snyder’s pretzels, Cape Cod potato chips, and Lance crackers. Mark A. Clouse became chief executive of Campbell Soup Co. on Jan. 22, 2019. Clouse, who started Jan. 22, told analysts that the biggest surprise so far about Campbell was the strength of its snack business, centered on the newly acquired Snyder’s-Lance Inc. That unit should be able to grow more quickly than the low single-digit percentage gains it’s currently posting, he said. As to the company’s core soup business, which has struggled for many years, that’s going to take a “much more holistic and comprehensive approach,” he said, and promised to share more at an investor meeting in June. “We possess the best knowledge of the soup business in the industry,” he said. Campbell’s shares were up 10 percent, to $36.21 on the New York Stock Exchange. The shares traded for as little as $32.03 in May after former CEO Denise Morrison abruptly retired, but they were worth more than $40 earlier last spring. Sales in the quarter were $2.7 billion, up 24 percent from $2.18 billion a year ago, thanks largely to gains from the purchase of Snyder’s-Lance for $6 billion last March. Campbell reported adjusted earnings per share of 77 cents for the three months ended Jan. 27, down from $1 in the comparable period a year ago. That was above the 70 cents per share average of estimates compile by Yahoo! Finance. The company’s net loss for the quarter was 20 cents per share, or $59 million, due in large part to a $346 million impairment charge on the Campbell Fresh unit, which it is selling as part of portfolio restructuring announced in August. Campbell announced the sale of Garden Fresh Gourmet, which makes salsa, other dips, and chips, on Tuesday for an undisclosed price. Campbell bought Garden Fresh in 2015 for $232 million. Since 2016, Campbell has written off more than $1.4 billion from the value of businesses it had acquired since 2012. Brazilian investment firm 3G Capital, which spearheaded the 2015 merger of Kraft Foods Group and H.J. Heinz Holding Corp., has historically relied heavily on cost-cutting to spur stock gains in the companies it controls, but has had less success increasing sales — an industry-wide problem. 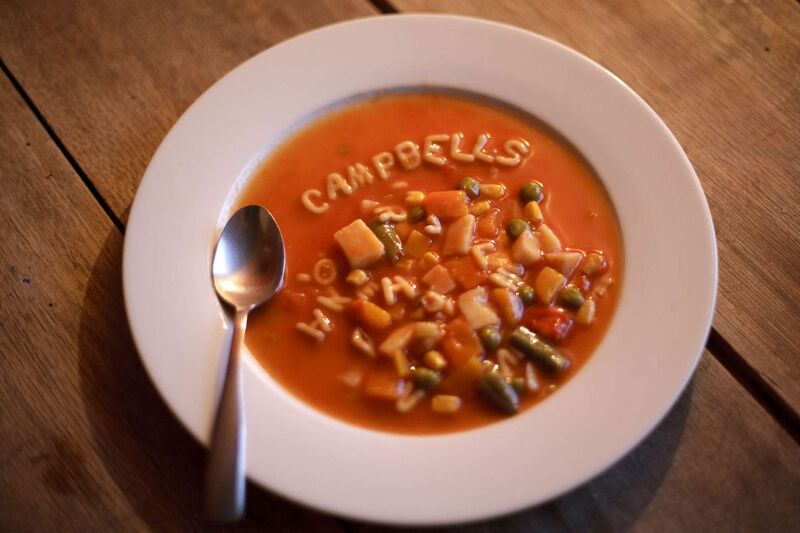 The quarter brought no relief to Campbell’s namesake soup business, which continued to lose market share in the 52 weeks ended Jan. 27, falling to 58.2 percent. Dollar sales were off 5 percent, the company said. The overall category was down 2.4 percent. “It seems like retailers have been less enthusiastic about the category and maybe looking at ways to harvest profits out of it,” Bank of America Merrill Lynch analyst Bryan Spillane said on the call. One of Clouse’s predecessors, Douglas R. Conant, managed in the early 2000s to generate some short-lived momentum in the soup business by adding pull-top lids on cans, installing a new shelving system in stores that was easier to stock, and introducing Soup at Hand (now called Soup on the Go) in a microwaveable cup for sipping.